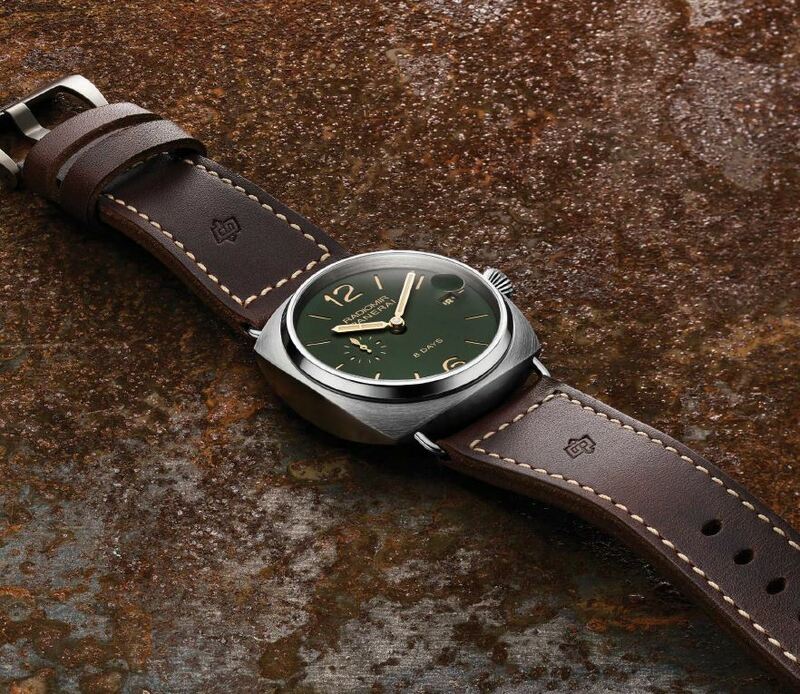 Officine Panerai, the Italian designed, Swiss made watch brand with a remarkable military history, has broken new ground with its latest creation, a limited edition collection of pieces featuring dark green dials. 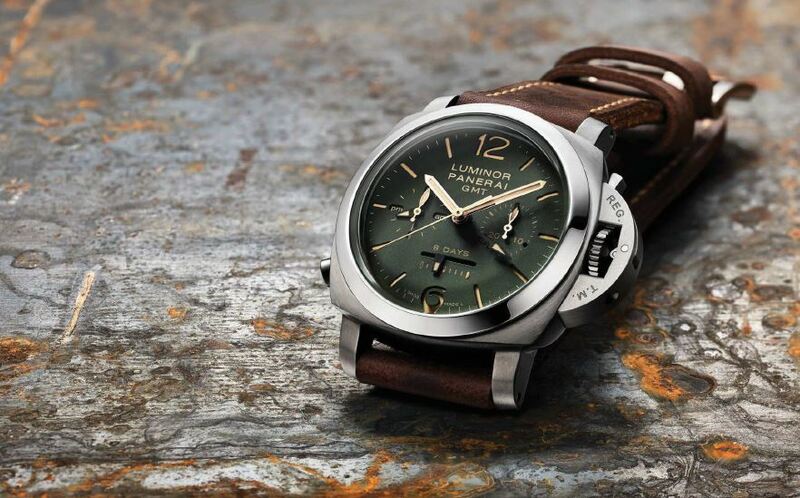 While colored dials are something Panerai has produced only a handful of times, and the green version is certainly among the most striking, the shade is dark enough to have a bit of military flavor about it and is thus perfectly in line with Panerai’s aesthetics. 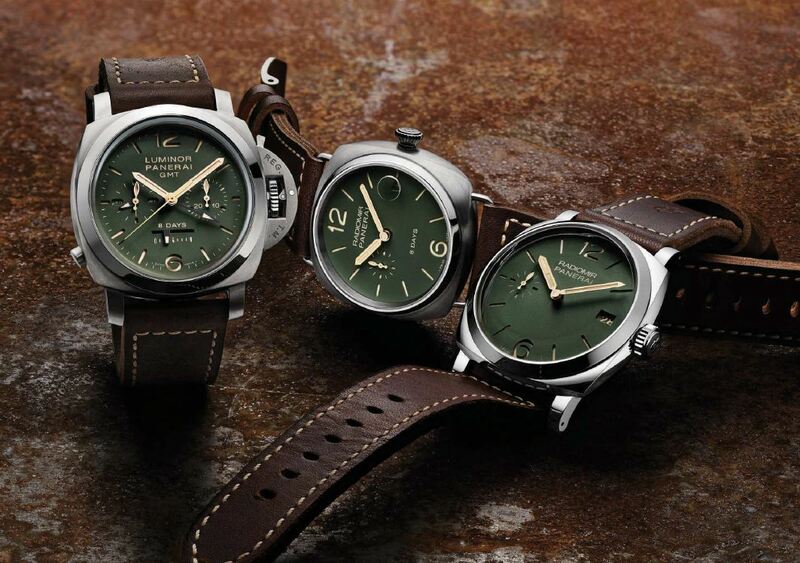 Say hello to three green dial Panerai watches. There are three different examples on offer, each featuring luminous beige markers, gilded hands and dark brown leather straps, and each delivered in a bespoke green cherry wood box. At the top of the list is the Luminor 1950 Chrono Monopulsante 8 Days GMT Titanio (PAM00737), clocking in at $18,100 and fashioned out of titanium in a 44mm case size. Panerai chronographs may not be as clean and classic looking as their base models but this is a handsome watch without question. Water-resistant to 100 meters, highlights include a polished bezel, a power reserve indicator at 6 o’clock, and GMT function. The watch is powered by a manual wind P.2004 calibre from the Panerai manufacture in Neuchâtel with an eight-day power reserve. The next two models are Radiomirs, Panerai’s other and older iconic watch design which does not feature its signature locking crown guard lever. $12,100 gets you the Radiomir 8 Days (PAM00735) Titiano in 45mm, much more of a minimalist look especially compared to the Luminor Monopulsante chrono. It also boats a brushed titanium case, and is powered by the P.2002 calibre manual wind movement. It is similar to the Panerai Radiomir California with an art deco dial, which is powered by the P.2000. Purists need not fret however thanks to the last green dial watch on the list, the Radiomir 1940 3 Days Acciaio (PAM00736). This piece comes in the old-school Panerai size of 47mm, which will be too large for many would-be customers but certainly makes a definitive statement. The stainless steel watch recalls Panerai’s famed design of 1940, when the Royal Italian Navy’s elite underwater commandos wore such pieces on their mission to destroy enemy ships. And it is powered by the P.3000 manual wind mechanical calibre with a power reserve of three days. Priced at $9,200 it’s the most affordable way to get into one of these exclusive new green dialed Panerais. Panerai has been experimenting with thinner cases as well of late, but this watch has all the classic chunkiness of a true original. 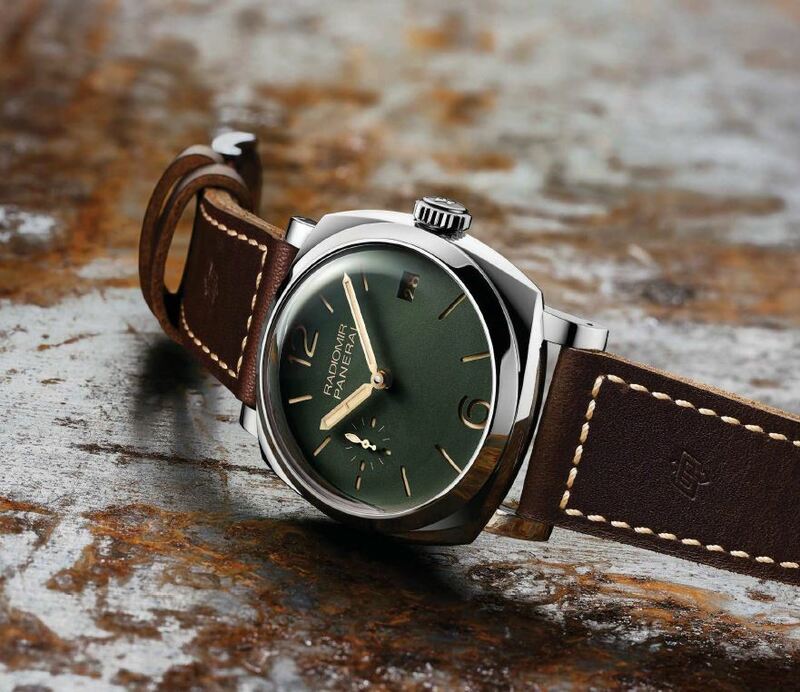 Do you like the new green dial Panerai series? Share your thoughts below on their latest collection below.